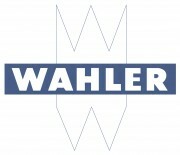 WAHLER develops advanced product solutions for the future, to improve performance and reduce emissions. When an engine has been running year after year without hitch, it is mainly thanks to the thermostat. This is because optimised heat management in an engine is a function of the right temperature. Failure to keep the engine at the right temperature will lead to damage of key parts and components. WAHLER ensures you can depend on its products to provide the maximum possible engine life.